The Working Lands Alliance announced its selections for the 2016 Farmland Preservation Pathfinder Awards at its Annual Meeting on November 16th. WLA honored Walter Adametz and the Town of Bethany with this year’s Pathfinder Awards for their work in advancing farmland preservation through leadership, advocacy, planning, and education. Pathfinder Award For Outstanding Individual: Walter Adametz Walter Adametz received this year’s Pathfinder Award for his years of service in promoting agriculture at both the local and county levels. Mr. Adametz currently serves as President of Middlesex County Farm Bureau and operates the family farm in Killingworth, CT.
Recognizing that Connecticut agriculture is impacted in various ways by local land-use commissions, Adametz approached his area’s regional planning agency and advocated for a regional agricultural council. In 2013, he coordinated with the Lower Connecticut River Council of Governments in establishing the first Regional Agricultural Council in Connecticut. Mr. Adametz has served as chairman of the Council since its inception. Walter Adametz’s advocacy and his efforts in setting the stage for what should prove to be a model for the growth and protection of agriculture for the rest of the State of Connecticut made him an easy choice for this year’s Outstanding Individual Award. Outstanding Group: The Town of Bethany: The Town of Bethany received this year’s Pathfinder Award for their commitment in helping to protect Cherry Tree Farm, an iconic Bethany landmark. Cherry Tree Farm is one of the last remaining farms in Bethany, which was once a thriving agricultural community. The 133-acre farm, which has been owned by the same family for over 150 years, has a high percentage of prime and locally important farmland soils making it a high priority for protection. 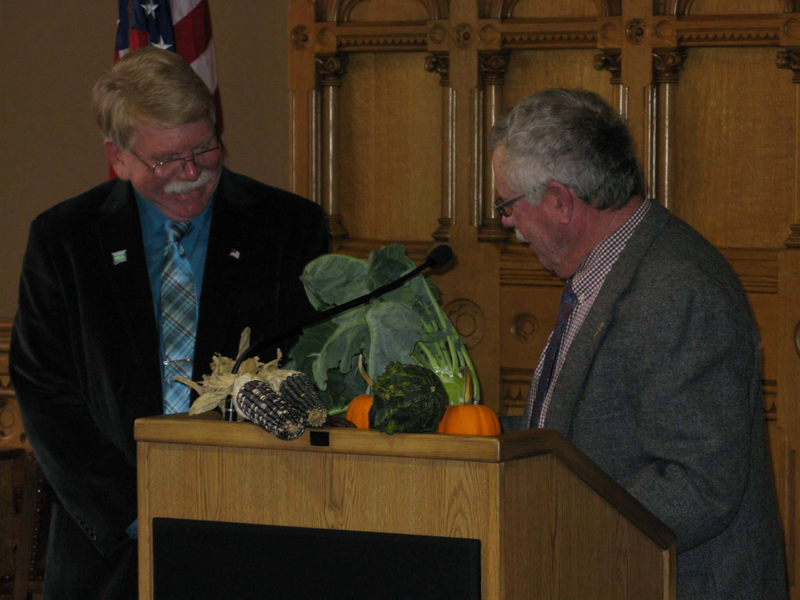 The Town of Bethany contributed 28% of the easement purchase price and worked with the CT Department of Agriculture, the Carrington Family and Connecticut Farmland Trust to ensure that the property remains farmland forever. 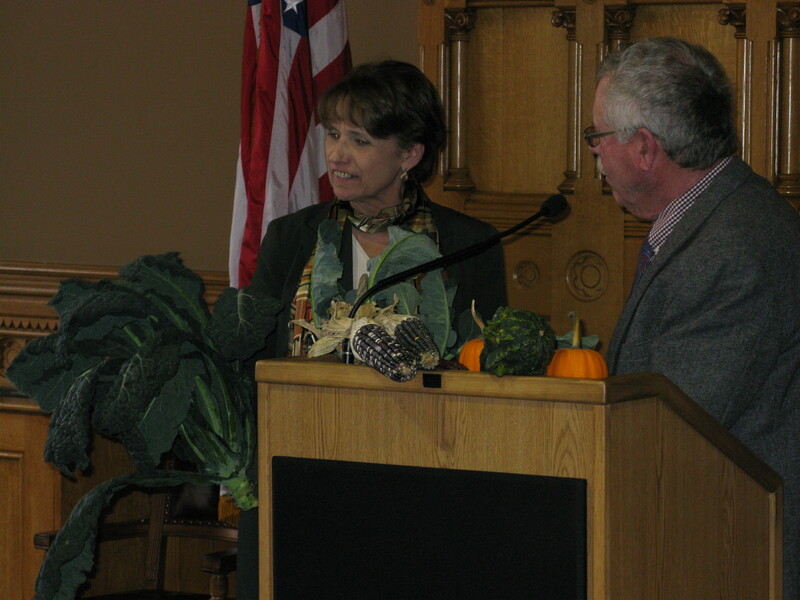 Derry Gorski, Bethany First Selectwoman, accepted the award on the Town’s behalf. Congratulations to the Town of Bethany for their hard work and for receiving this year’s Pathfinder Award for Outstanding Group. Established in 2003, the Farmland Preservation Pathfinder awards are designed to recognize individuals and groups that have significantly advanced farmland preservation through leadership, advocacy, planning, and education. Award winners over the last ten years have included municipalities, land trusts, farmers, town committees, and many individuals and groups who have logged countless hours in the name of preserving Connecticut’s most valuable resource – our farmland.